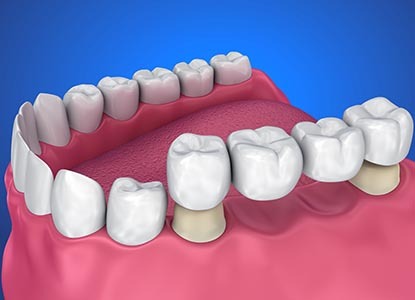 Whether replacing missing teeth or improving the appearance of worn or damaged teeth, modern Bridges and Crowns can be indistinguishable from natural teeth. Dental bridges are false teeth which are held in place by being anchored to neighbouring teeth. The ‘false tooth’ on the bridge will look as though it is coming from your gum and, thanks to advanced technology, is hard to distinguish from your real teeth. They can be recommended for a variety of cosmetic and also functional purposes. 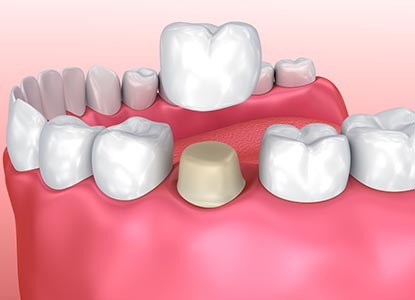 If you have a tooth that you are unhappy with – it may be that it is discoloured, chipped or looks slightly out of place – crowns are a great option. 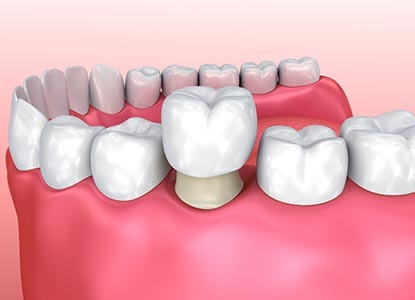 Crowns are also protect and improve the appearance of worn teeth (caused by grinding or acid erosion). A crown is like a special sleeve made of metal or ceramics (or both) that goes over a damaged or weak tooth. Your dentist will match it up to the shape – and, in the case of porcelain crowns, colour – of your other teeth so it will look natural. 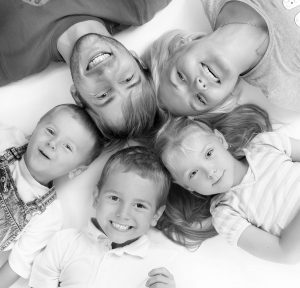 Here at Shine Dental we offer a range of different crowns, most of which are now free of metal, giving them a much more natural appearance and eliminating the possibility of an allergic reaction to metal. 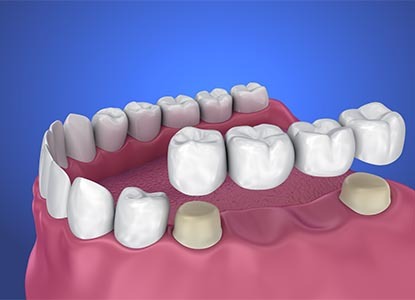 The false tooth is known as a pontic and is fused in between two crowns that serve as anchors by attaching to the teeth on each side of the false tooth, thereby bridging them together. The crowns on either side should last for 10-15 years, depending on the health of the tooth underneath and how well you look after them. Typically, crowns last for 10-15 years, depending on the health of the tooth underneath and how well they are looked after.